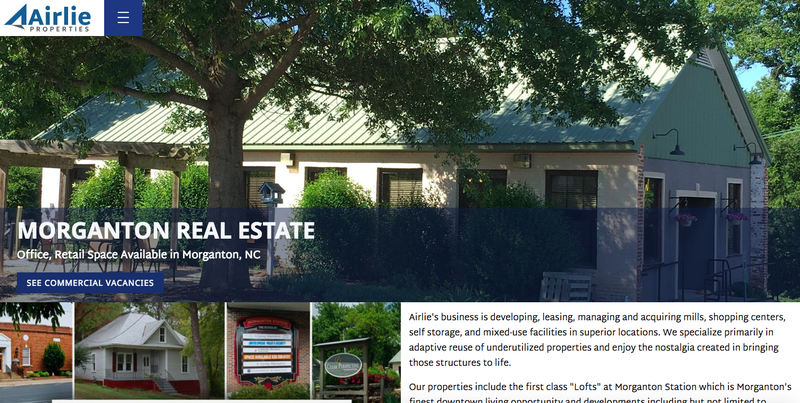 Morganton real estate developer, Airlie Properties, recently teamed with VanNoppen Marketing to design, develop, and launch a powerful new website to promote its commercial and residential properties. As a fully responsive website, AirlieProperties.com performs superbly across all current platforms and browsers. Simple and intuitive navigation enable visitors to view photos, floorplans and filter by availability and location. The new website also serves as a resource tool for Airlie’s customers with a protected portal, behind which tenants can view real estate listings and automatically pay their leases online. Tenants will also receive automated emails about their monthly payments and offer online payment options.